The Min Bed is an elegant minimal aluminum bed frame that focuses its attention on providing a low-profile and high-quality slat platform that allows for greater ventilation. Designed by Luciano Bertoncini in 2003, the Min Bed makes a metal bed framework feel sophisticated rather than industrial. The Min Bed (Queen Size) has a length of 82” | 208 cm, width of 63” | 160 cm, rail height of 12” | 30 cm, and platform height of 9 1/2” | 24 cm. The top mattress surface of the Min Bed has a typical height of 19 1/2” | 50 cm from the floor if a 10” | 25 cm modern mattress is used. What is the Min Bed? The Min Bed is an elegant minimal aluminum bed frame designed by Luciano Bertoncini (2003) that focuses its attention on providing a high-quality slat platform for greater ventilation. How big is the Min Bed? The Min Bed (Queen Size) has an overall length of 82” | 208 cm, width of 63” | 160 cm, rail height of 12” | 30 cm, and platform height of 9 1/2” | 24 cm. How high is the bed surface on the Min Bed? 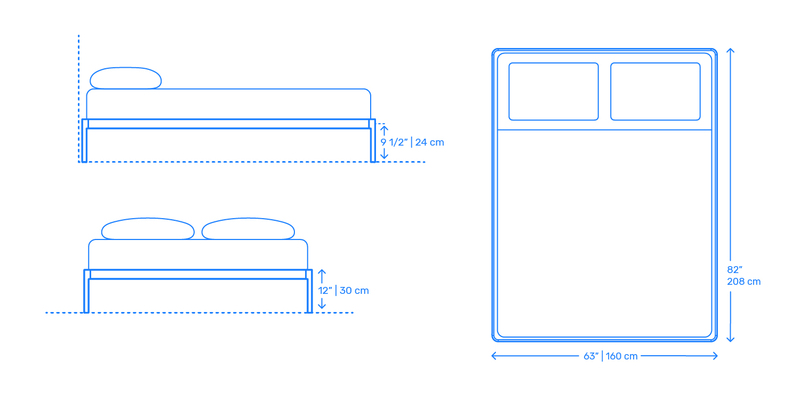 The overall bed height of the mattress on the MIn Bed is 19 1/2” | 50 cm from the floor if a typical 10” | 25 cm modern mattress thickness is used.